The trend toward high-capacity "farms" and mega-slaughterhouses has transformed the process of food production into a mechanistic, industrialized system of chemical dependency. The impact this system is having on the planet, the animals, our health, and future generations is dreadful, and getting worse. The negative effects of factory "farming" go far beyond the issues of food contamination and uncontrolled pathogens. It's not just listeria, salmonella, avian flu, mad-cow, and O157:H7 that are the problems. Those are just symptoms of a food system that is radically flawed. Consider the modern feedlot, where most conventional beef cows live out the last few months of their lives. There they'll often live to about 15 months of age, weighing perhaps 1,100 pounds or more --- thanks to plenty of corn, medication, and hormones. Cows weren't designed to eat large quantities of corn, and they tend to get sick when forced to. But today's feedlot pumps meds through the animals to prevent them from dying prematurely. A typical modern feedlot. Manure, corn, and pharmaceuticals. Aesthetically, feedlots are unpleasant places. They are usually barren of grass. 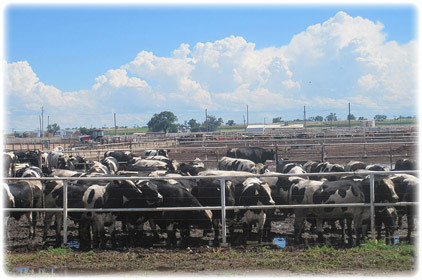 Due to the concentration of cows, feedlots tend to stink, with enormous quantities of manure. The facilities are in no way "natural" to a cow. They are factories, cranking out units of production (fat cows) as cheaply as possible. The copious amounts of manure contain drug residue, which eventually ends up in the ground water or on the land. Eventually the cows get slaughtered, their meat being heavily marbled with fat which is nutrient deficient, and also containing drug residue. The drugs and the unhealthy meat get eaten by humans, who then get sick --- sometimes slowly, sometimes quickly. The mega-slaughterhouses (factories which process animals on an unprecedented scale) only make things worse. They amplify the problems by concentrating the animals and processed meat (together with any potential pathogens) into a single facility --- and then distributing the product to dozens or even hundreds of retailers. Friends, I'm convinced the solution to all this doesn't lie with the CFIA. We needn't look to the civil government to "fix" things. The problem isn't a lack of regulations. Rather, the problem is the culture's unrelenting demand for cheap food. "Give me more food, for less money, right now." The industry responds with confinement operations, industrialized farms, massive slaughter plants, manure lagoons, chemical sprays, and pharmaceutically-enhanced feeds. I'm not even touching on GMO's here. All of this in order to produce cheap food. But, that food isn't really so cheap after all, when you consider the costs to the animals, the land, and future generations. So I'm suggesting you get to know your farmer. In this way you'll be getting to know your food, where it came from, and how it was processed. Find out how and where your meat was slaughtered, and where it was cut/wrapped. Ask questions. Buy from local, family-run organic farms --- ones you trust. Consider your food decisions, and the impact they have on the generations still to come. I believe that as more of us do this, we can gradually transform our communities, our families, and our planet.